In a unanimous vote earlier this week, the Washington State Senate passed HB 1906, a measure designating each April 10th as Dolores Huerta Day. 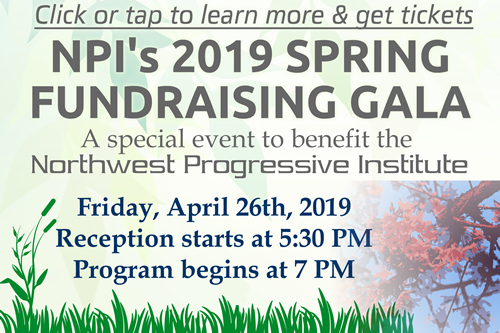 Huerta was in the wings to witness the forty-four to zero vote, accompanied by the bill’s sponsor, State Representative Lillian Ortiz-Self (the featured speaker at NPI’s 2016 Spring Fundraising Gala on Mercer Island). The legislation had previously passed the House of Representatives overwhelmingly, with only a few militant Republicans in opposition. Governor Jay Inslee subsequently signed the bill into law in a ceremony on Thursday morning, flanked by a large group of lawmakers and activists. Dolores Huerta, as many readers of the Cascadia Advocate likely know, is a trailblazing American labor leader and civil rights activist. In her early years, Huerta worked as a teacher while also raising a child as a single mother. After seeing the poverty her students faced as children of farm workers, Huerta joined the rising movements to improve the living and working conditions of farm workers. In 1962, she, along with César Chávez, formed the National Farm Workers Association (NFWA), which eventually became the United Farm Workers of America. She also helped organize the Delano grape strike in 1965 in California. Huerta worked within these movements to also fight against gender discrimination and went on to work on many other issues, including immigration reform, income inequality, and the rights of women and those in the Latino community. She received many awards for her lifetime of service, including the Eugene V. Debs Foundation Outstanding American Award, the United States Presidential Eleanor Roosevelt Award for Human Rights and the Presidential Medal of Freedom. She was also the first Latina in the National Women’s Hall of Fame. “Women’s History Month celebrates the vital role of women in American history, and Dolores Huerta is one of those women we recognize as instrumental in the fight for farm workers’ rights,” said Senator Rebecca Saldaña (D-37th District). April is Women’s History Month, and Ortiz-Self is proud to have successfully guided House Bill 1906 through the legislative process. While Dolores Huerta Day will no doubt be celebrated and observed during this legislative session, it will not be officially added to the state’s list of holidays until later this year because the bill does not take effect until ninety days after the date the Legislature adjourns. “I am proud that Washington will now honor the legacy and recognize the remarkable life of a tireless worker, a passionate advocate and a true fighter. A warrior whose unwavering quest for civil rights, equality and justice continue to make our nation a more perfect union,” said Ortiz-Self. Washington is the second state in the nation to recognize Dolores Huerta Day, after California, which adopted similar legislation in 2018 (AB 2455).